Young Variety is a young professionals networking group for 18-40 year olds with an aim to raise awareness of Variety SA and connect like-minded young people. We aim to assist our members in developing professionally, personally and philanthropically. We engage our members in challenging and quirky fundraising functions and events while providing opportunities for them to engage with the amazing work of Variety SA. The money we do raise with our events focuses on disadvantaged youth. We need your help to achieve all of our goals. Whether you only have a few moments every month or would like to make a long term commitment, we want to hear from you! Click here to send us your contact details. Young Variety is a not-for-profit young professional networking group. We aim to raise awareness of the work performed by Variety SA for children and families in the South Australian community, and to develop our members professionally, personally and philanthropically. Learn more about Young Variety, what it is and how you can get involved. Young Variety is dedicated to supporting disadvantaged youth in South Australia, and we do that in a number of ways. Young Variety is very excited to support Youth Opportunities Association (SA) this year with their fantastic programs helping young people find the tools they need to make the right choices for their future. You’ll meet the students, the trainers, and members of the community who will all be directly affected by your support of Young Variety SA! Stay tuned here on Facebook over the coming weeks to meet some of the amazing people involved. At the core of Young Variety is great events for young people of South Australia. Young Variety presents a celebration of summer, snags and the great Aussie tradition of a bowls night on a balmy evening. All proceeds will go to Variety SA. Your evening includes unlimited rounds of bowls, great value drinks and a free BBQ! There will be extra games and lots of fun on the night so rally the squad and get around Friday drinks! Tickets are $10 online, or $15 on the night and include all you can bowl and a BBQ. Please note, there are no EFTPOS facilities on site so please bring cash for drinks, raffles and games. 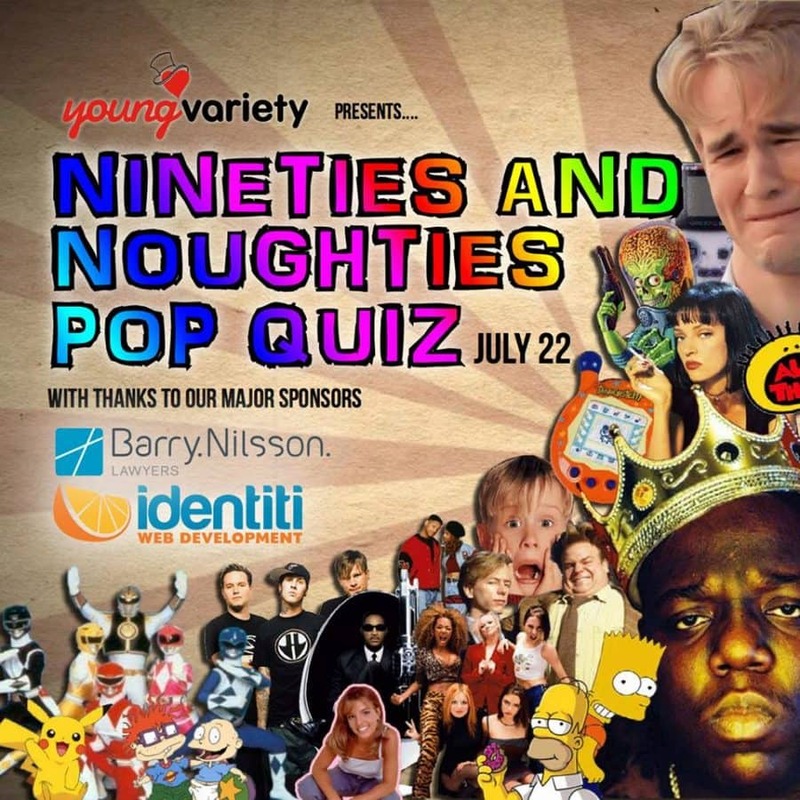 Special thanks to Young Variety major sponsors Barry.Nilsson.Lawyers and Identiti Web Development. The Young Variety committee consists of number of young and talented professionals all volunteering their time to assist children in need. Morgan is a Graduate Accountant at Nitschke Nancarrow accounting firm, and joined the Young Variety team in late 2014. In 2013 she completed her Commerce (Accounting) degree from the Adelaide University and is currently studying to become a Chartered Accountant. Coming from country South Australia she has seen how beneficial Variety is to so many people and wanted to get involved and give something back. Outside of working life and Variety, Josh enjoys the cricket, a hit of golf and Friday nights out! In her free time, Morgan loves catching up with friends over a glass of wine and walking her dog. Nikki works in student engagement and business development at Flinders University and joined the YVariety team in late 2012. She comes with a strong background in working and volunteering for numerous not-for-profits in the disability sector and believes strongly in the values and mission of Variety. In her free time, Nikki loves a weekend adventure with friends, a glass of wine, a cheese board, and thrives off summer days or snow covered slopes. Sam joined the Young Variety Committee at the start of 2016. Sam is a Senior Associate at a prominent boutique Australian law firm, primarily representing UK Underwriters in complex commercial litigation and dispute resolutions. With a strong interest in social finance and enterprise, and a passion for adventure travel, Sam has provided legal and business advice to various NGOs in the Northern Territory and Africa. Sam is also member of the mighty Adelaide Hockey Club premier league team, plays guitar, and he loves the beach. Fiona Krawczyk is the a member of the Executive at Haigh’s Chocolates and leads the Marketing team. Her background lies in marketing, communications, digital media and general management with experience in the arts, retail, tourism, wine and food industries. Fiona joined the Y Variety committee and became a part of the Variety SA family in 2012 when she returned to Adelaide after living in regional South Australia for ten years. During her time in the South-East Fiona was involved in various community groups and thoroughly enjoyed participating and helping her local community in this way. Her passions outside of her work include good food, great wine, family, cricket, the arts and friends, in no particular order and usually a combination of! Kimberly has been working in the finance industry for almost 10 years, most recently at a Hedge and Treasury Accountant for Accolade Wines. Kim’s involvement with Variety has been for just as long, if not longer. Due to her parents involvement in the charity (Scott Limbert former 4WD Challenge Chairman & Wendy Limbert current 4WD officials and committee members) Kim has been exposed to the great events and wonderful charitable work that Variety undertakes. And as soon as she was able, Kim wanted to be a part of it. Kim joined the YVariety committee in 2011, with the aim to get as many of the ‘younger generations’ involved after seeing the fun and rewarding results first hand. Outside of work and Variety, Kim is heavily involved in the Swish Netball Club with a love of all sports, and any activity where we can combine sunshine and a glass of wine. Domenique is a public relations consultant at Ball Public Relations. Domenique consults to a broad range of clients in high-end retail, energy, not-for-profit and local government. She advises on communication and social media strategies and assists with online management research and development. Domenique holds a Bachelor of Journalism and a postgraduate diploma in Human Resource Management both from the University of South Australia. Domenique joined the Young Variety committee to make a real difference in the lives of disadvantaged youth in South Australia. Outside of work her passions include her family, partner and two enormous dogs. Julian Modra is Event Manager at Brand South Australia (formally SA Great), a not-for-profit, member-based organisation that uniquely connects with the South Australian government, media and businesses, to promote confidence and pride in South Australia’s creativity, innovation and industriousness. Here Julian oversees all 90+ member based events, Media Famils, The South Australian Regional Awards, and the Australian of the Year Awards for South Australia along side the Australia Day Council. Julian began his love of events while coupling his strong passion for cars while at the Sporting Car Club of South Australia running almost 40 motorsport events a year for the organisation on a national and state level. Following this he completed an Advanced Diploma of Event Management at TAFE SA before starting at Brand South Australia. With a desire to begin giving something back, Julian joined the Y Variety Committee in 2013. He looks forward to sharing the great work Variety and Y Variety do in the community and helping getting more people involved in the organisation and charities. He also looks forward to one day participating in the Bash. A multi award winning artist both here and in the USA that has Cat’s talents continuingly recognised within the music industry. Cat has performed at most major festivals both here in Australia and the USA as well as many major sporting and corporate events. Cat’s singles have been seen on Australian, European and American Charts, with a number of top five spots including a number three on the European Independent Charts. Cat’s talents don’t stop with her music, with a strong consistent media presence and multiple prestigious acting roles including the lead role in the R.M. William’s Australian Outback Spectacular appearances on McLeod’s Daughters, Headland, Home and Away and many featured TV commercials including Farmer wants a Wife, KFC, Tooheys to name just a few. For the past 7 years Cat has been a Proud Ambassador for Variety, Cat has also been an active YVariety Committee member for 6 years, helping to raise awareness for Variety and engaging the next generation of generous givers. Ammi joins the Variety team from a marketing consulting business, working with another not-for-profit client and their volunteers. She has completed a Bachelor of Business Management, with a major in Marketing, and has gained previous experience in marketing, public relations and events across the retail industry, including driving the opening campaign of the IKEA store in Adelaide. “Working at Variety is a very satisfying experience. I enjoy the opportunity to give back to the community where I can, and seeing first-hand the benefit the children get from the work we do just makes me want to strive harder and achieve more for them,” she says. In her spare time she enjoys keeping fit by running and going to the gym to counteract her other passion, good food and wine! We are currently seeking major partners and in-kind sponsors to assist our work and fundraising efforts. Details of these opportunities are outlined below. • 2 x tickets to the prestigious Variety SA Show of Hearts. Rather than making monetary contributions, In-Kind Sponsors donate goods or services to support our fundraising events. All in-kind sponsorship agreements are exible and individually tailored to suit your needs.